One of the worst kept secrets in beer is the emergence the specialized, sport drinker. The sport drinker is much more than a legend in his/her own mind. Indeed, these individuals have been instrumental in propping up a new kind of beer establishment. What is sport drinking? It's the art of collecting as many beer pelts as possible during any and all drinking sessions. Folks engaged in this sport usually don't care about quaffing mass quantities of any particular beer. Instead, they chase smaller servings of many beers. Even in beer-centric Portland, that represents a fairly dramatic change from earlier times, when folks visited breweries and brewpubs to enjoy a pitcher or pints of a favored beer. There was no real hunt for specialty beers, no desire to seek out variety. People drank what they liked and called it good. Of course, that scenario is still in play. Plenty of folks go to breweries and brewpubs and drink pitchers and pints in what might be best-described as an entry-level craft beer experience. Because there are more casual beer fans than serious beer geeks, the best breweries and brewpubs continue to flourish. But the evolving, maturing beer culture is producing a growing number of sport drinkers, who existed in previous times only in small numbers. These folks demand special beers. Local beers, no matter how good, aren't enough. They want stuff from outside the city and state. The result of that growing demand is the eccentric beer bar. Some of our notable local destinations include APEX, Beermongers, Belmont Station, Baileys/Upper Lip, Bridgetown Beerhouse, The Imperial Bottleshop, Roscoe's and Tin Bucket. 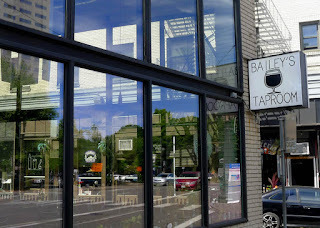 But that's only a fraction of the possible list because there are countless places that feature extensive tap lists and don't quite fall into the beer bar category. "These bars fill an important niche," an industry source tells me. "They showcase beers from far flung breweries like Barley Brown's and Arch Rock, which many Portlanders would never have heard of otherwise. They also provide a sense of what's happening across Oregon without driving to Bend, Hood River, Eugene and the coast." I have to admit I'm far more likely to visit a beer bar than a brewery. I enjoy the variety. The downside for many is the snobbishness that's sometimes part of the deal. Beer bars can be intimidating places for casual drinkers, which is shameful and needs to change. By the way, it turns out sport drinking and beer bars are nearly a perfect fit. We just learned via a Brewers Association article that the smaller pours generally preferred by sport drinkers actually deliver higher profits per keg to bars Go figure. Where do were go from here? Honestly, who knows. Portland's maturing, evolving beer scene presents creative entrepreneurs with a nearly endless array of opportunities. We've passed the point where you need to own or operate a brewery to tap into the beer economy. There are alternatives. Those who have mastered or are mastering the art of sport drinking can be proud.